Surprisingly, this is the first full-length study devoted to Matthew’s use of Zechariah by way of quotation and allusion. Three times he cites Zechariah (21.5; 26.31; 27.9-10), and on at least eight occasions he alludes to the prophet (23.35; 24.30, 31, 36; 25.31; 26.15, 28, 56). It is the messianic vision of Zechariah that has appealed to Matthew, with its elements of the restoration of the humble Davidic king, the smiting of the divinely appointed shepherd, the creation of a renewed remnant, and the worship of Yahweh by all nations. 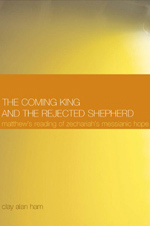 Among the questions Ham undertakes to resolve in this precise and clearly presented monograph are: how much Matthew’s reading of Zechariah owes to his Jewish predecessors, how much he is in harmony with other early Christian readers of the prophet, and to what extent his image of Jesus has been shaped by Zechariah’s eschatological hopes. Clay Alan Ham is Professor of New Testament, Lincoln Christian College and Seminary, Lincoln, Illinois. [A] fine contribution to the growing field of the use of the Old Testament in the New Testament … [It] has advanced the scholarly project. The value of Ham’s work lies in his demonstration that Matthew’s use of the Old Testament goes well beyond mere proof-texting and atomistic exegesis … Ham’s study should be welcomed by students of Matthew and by those concerned with the function of the Old Testament in the New. His sensitivity to the wider context of the passages from Zechariah and the passages in Matthew where they are found is commendable. [Ham] has given us a more thorough study on the question on the relation of Matthew to Zechariah than has been done hitherto. Consequently, his gathering of data and copious notes give the reader valuable resources for developing an understanding of the influence of Zechariah 9--14 on Matthew and make a worthy contribution to this study.